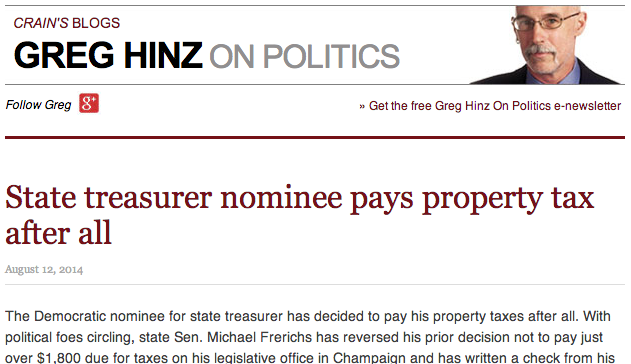 Greg Hinz @ Crain's Has The Exclusive: Looks Like Mike Frerichs Came Down From His Ivory Tower And Paid Taxes!? The Democratic nominee for state treasurer has decided to pay his property taxes after all. With political foes circling, state Sen. Michael Frerichs has reversed his prior decision not to pay just over $1,800 due for taxes on his legislative office in Champaign and has written a check from his campaign account covering levies due for six years, back to 2008. After Crain's broke the story about the tax debt last week,"we got together and said 'This is ridiculous,'" Mr. Koutsky said. "We'll continue to appeal it, but in the mean time, let's just pay it." ...Asked why the payment came now — as opposed to any time back to 2008 — Mr. Koutsky said the Frerichs campaign "saw an oversight, and acted on it." ...The Illinois Department of Revenue earlier had rejected Mr. Frerichs' request for an exemption, citing its ruling in a similar case several years ago involving state Rep. Monique Davis, D-Chicago. The department has encouraged Mr. Frerichs to appeal if he believes he has a case. ...Mr. Frerichs also had failed to pay the tax on his political office, which also is rented from the transit district, until questions were raised. His campaign said it believes that the bill for that tax inadvertently went to the legislative office, which didn't pay it because it was believed to be part of the larger tax dispute.